Why Did This Smiling Man Just Pay $118K for That Fish? As with all regional cuisines, Japanese food comes in its purest form in Japan. And with that comes insanely popular restaurants and batshit-priced foods, like Sukiyabashi Jiro restaurant, which has a months-long reservation waiting list. Or, as what happened this week, when one man bid $118,000 for one fish. Yes, one fish, that wasn't Nemo. The Financial Times reports Japanese sushi baron Kiyoshi Kimura, president of the Sushi Zanmai chain, bid $118,000 (14 million Yen) for a single fish at this year's New Year's auction at the Tsukiji fish market. The endangered blue fin tuna weighed in at a whopping 440lbs (200 kg), costing more than $268 per pound. Hell you could buy like two houses in Detroit for that much. The titanic bid doesn't come as much of a surprise, as Kimura has been the highest bidder the last five years at the market's annual celebration, including in 2013 when he paid a record $1.76 million (155 million Yen, based on the 2013 exchange rate) for one fish. 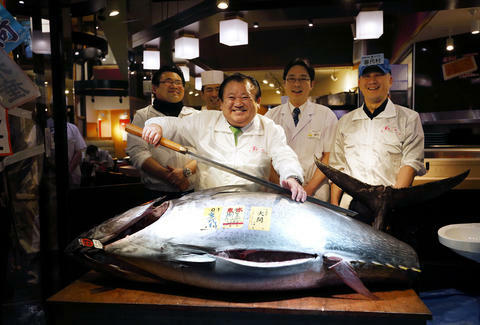 Kimura calls himself the "King of Tuna," as his face is plastered about town in front of his restaurant chain. Definitely better than being "King of Scrod." But the bid also left conservationists seeing red, as the auction shows the popularity of the already overfished blue fin. One of Japan's biggest tourist attractions, the Tsukiji fish market garners plenty of curiosity throughout the year. But the New Year's auction has been a tradition at the 80-year-old market, and this year's edition was especially notable, as the market will move to a new location in November. Additionally, as the Wall Street Journal notes, the exorbitant prices come because "foods made available for the first time during the year, including tuna, fruits and vegetables" are considered omens of good luck. Apparently, lots of money can buy you lots of luck. Or, at least, 440lbs of blue fin tuna. Ryan Craggs is Thrillist's Senior News Editor. If you're wondering about the bolded words, it's the title of a Dr. Seuss book about fish. Now it's complete. Follow him @ryanrcraggs.